Alloy and Diffused Diodes – Two commonly used techniques for Diode Fabrication Process and Packaging are the alloy method and the diffusion method. To construct an alloy diode, a pn-junction is formed by melting a tiny pellet of aluminum (or some other p-type impurity) on the surface of an n-type crystal. Alternatively, an n-type impurity may be melted on the surface of a p-type crystal The process is illustrated in Fig. 7-5(a). Figure 7-5(b) shows the diffusion technique for Diode Fabrication Process and Packaging. When an n-type semiconductor is heated in a chamber containing an acceptor impurity in vapour form, some of the acceptor atoms are diffused (or absorbed) into the n-type crystal. This produces a p-region in the n-type material and thus creates a pn-junction. The size of the p-region can be precisely defined by uncovering only part of the n-type material during the diffusion process, (the rest of the surface has a thin coating of silicon dioxide). Metal contacts are electroplated on to each region for connecting leads. The diffusion technique lends itself to the simultaneous fabrication of many hundreds of diodes on one small disc of semiconductor material. This process is also used in the production of transistors and integrated circuits. As discussed already that semiconductor diodes vary widely in size, depending on their application. 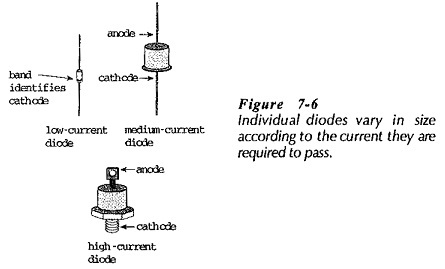 Figure 7-6 shows typical single diode packages for low, medium, and high current devices. In Fig. 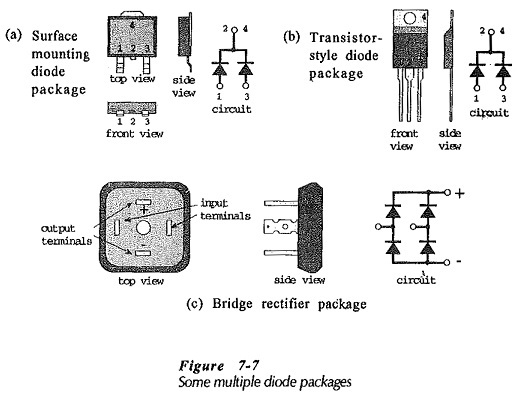 7-7 multiple diode packages are illustrated. Two diodes in a surface mount package are shown in Fig. 7-7(a), and two in a power-transistor-type package are illustrated in Fig. 7-7(b). Note from the circuits that the cathode terminals are internally commoned in each case. A rectifier assembly is shown in Fig. 7-7(c). This is four diodes connected to function as a bridge rectifier and contained in one package. One side of the package has a metal plate for mounting on a heat sink. The two output terminals are identified as + and -, and the other two terminals are for the ac input.